With unbelievably challenging climbs and an innovative approach to route design, the Vuelta emerges as a fan favorite grand tour. IF RIDERS BLINKED, THEY MIGHT HAVE missed it. 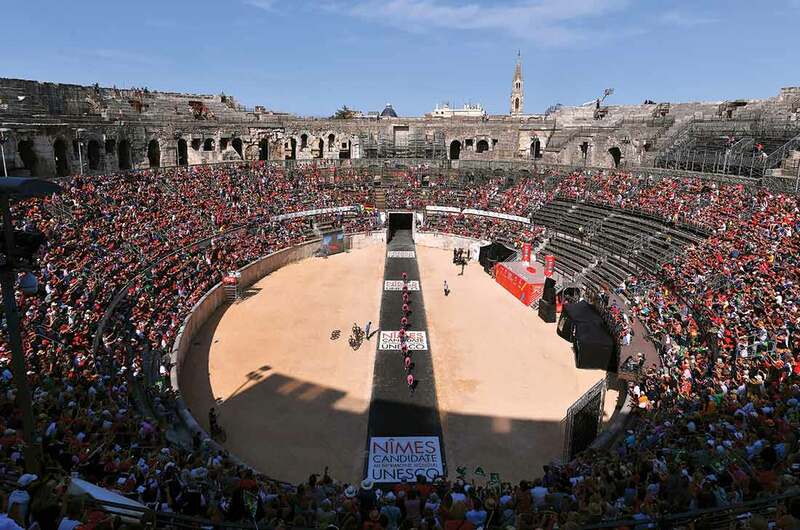 Barely two kilometers into the opening stage of the 2017 Vuelta a España, teams roared straight through the center of a 2,000-year-old Roman arena that once hosted gladiatorial battles. 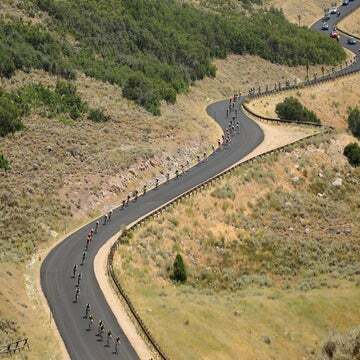 On a hot, sticky afternoon in late August, squads of cyclists, dressed in Lycra and riding carbon-fiber stallions, blasted through the middle of the circular stadium over some hastily laid tarmac in the opening day team time trial. It was a pure Vuelta moment. featured ramps as steep as 28 percent. That wild parcours reflects what we have now come to expect from the Spanish grand tour, which throws one crazy finish after another at the pack. La Vuelta Ciclista a España — the cycling tour of Spain — has emerged as the most unpredictable and most entertaining grand tour on the international calendar. Every year race organizers make sure that every stage delivers something to remember — be it a steep goat path up the side of a mountain or a Roman arena. By most counts, their efforts are paying off. Every grand tour has its own distinctive flavor. The Giro d’Italia is renowned for its tifosi and the Dolomites. The Tour de France boasts the Alps, the tradition, and the prestige. The Vuelta? It packs unpredictability, unconventionality, heat, and, more than anything else, the sense that you’re watching one hell of a bike race. THE VUELTA WASN’T ALWAYS the most exciting grand tour. For a long time, the Spanish tour was a snooze-fest, the perfect excuse to have a siesta on a hot, lazy afternoon. Before 1995, when organizers moved it from April to September, it was almost entirely a race for Spanish riders and teams to focus on. This year’s Vuelta includes a who’s-who of the peloton; that wasn’t usually the case. How many Vueltas did Lance Armstrong race once he became Tour king? Nada. Spanish riders and Spanish teams always targeted the Vuelta. It made sense because it was their race. Back in the 1970s and ’80s, there were literally a dozen top-level pro Spanish teams in the peloton, so the Vuelta had a heavy Spanish accent. In 1985, when it appeared Robert Millar (now Philippa York) was on the cusp of becoming the first British rider to win a grand tour, the entire Spanish peloton ganged up on him and colluded to allow Pedro Delgado to take the overall title. La Vuelta es nuestro! The Vuelta is ours. For just about everyone else in the peloton, the Vuelta was a training race. Eddy Merckx raced only one Vuelta, in 1973, when he won six of 17 stages, as well as the points and combined jerseys, and placed second in the climber’s jersey competition. He never returned. During several editions, the Vuelta hardly stretched two weeks long, and there were few mountain stages. It was sprint after sprint, with plenty of time trials. Sean Kelly, a sprinter and classics rider, won his lone career grand tour at the Vuelta in 1988. In 1984, a neo-pro named Eric Caritoux won by the Vuelta’s smallest margin of victory: six seconds. It took the race jury 30 minutes to decide he won. By the late 1990s and early 2000s, the Vuelta almost became a paid holiday for many of the big stars. Those were the days when the Spanish economy was booming and there was plenty of money sloshing around. Running parallel to the race was the infamous “Vuelta de la Noche,” a nightly bacchanal of sponsor parties after every stage across Spain. Podium girls, soigneurs, sport directors, mechanics, journalists, race officials, and even the odd cyclist would be partying until the wee hours. In 2010, Stuart O’Grady and Andy Schleck were both sent home before stage 10 when team boss Bjarne Riis found them sneaking back to the team hotel at 5 a.m. after an all-nighter at the bars. VUELTA RACE DIRECTOR Javier Guillén takes a deep breath as he sits down to chat with VeloNews a day before the start of the 2017 Vuelta. As can be expected, he’s very busy. Tall and slim with drooping eyes, Guillén has led the Vuelta since 2008. 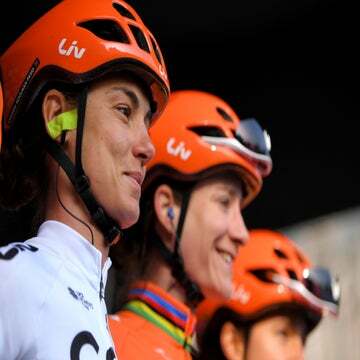 That’s the same year that Amaury Sport Organisation (ASO, owners of the Tour de France and other major cycling properties), bought a 49 percent share of Unipublic, the Madrid-based events company that took over the Vuelta in the 1980s. If it wasn’t for ASO, which took over complete ownership in 2014, there might not even be a Vuelta today. The pro peloton was flying close to the sun in the mid-2000s, and so was the Vuelta. There was no shortage of sponsors or host cities lining up to be part of the Spanish grand tour, but it was a facade. All that came crashing down in 2008, just as the world economy cratered. Spain’s booming economy suddenly went bust. Unemployment shot up to 25 percent, and the government introduced an austerity program to keep a rein on rising deficits. That might have saved Spain from bankruptcy, but it was a death knell for Spanish cycling. Regional governments, which had been the main source of funding for bike races and bike teams across Spain, didn’t have money for such indulgences. The Spanish peloton went from nearly a dozen top pro teams to just two today (Movistar and Caja Rural), and its burgeoning racing calendar shrunk. The Spanish cycling federation faced a 50-percent budget cut, and couldn’t afford to fly riders to major events like cyclocross or mountain bike world championships. A lawyer by trade, Guillén admits he leaves the finer details of route design and road selection to his technical team, led by former pro Fernando Escartín. Instead, Guillén plies the boardrooms across Spain as he tirelessly pitches the Vuelta to sponsors and government bodies looking to use the race to promote their regions as tourist destinations. 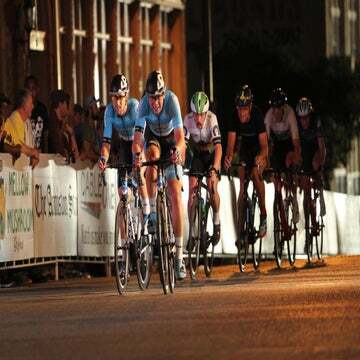 Before anything, bicycle races are businesses. And Guillén realized that the Vuelta needed to find its niche. To do that, he took the race away from the big flat roads, and into the Spanish heartland. The Vuelta used to roam almost without purpose, or narrative, from one major city to another. The stages were often run through an uninspiring series of traffic circles and along boring flat straightaways. Local residents would complain about road closures. No one was happy. With the big cities pinched for money, Guillén found interest in secondary towns and off-the-radar regions looking to boost tourism. The Vuelta reached out to España profunda — rural Spain — with surprising success. After the Angliru climb came stages to such places as Bola del Mundo, La Campera, Ezaro — all ridiculously steep ramps that guaranteed fireworks. The perfect example of a new Spanish host town is Valdepeñas de Jaén, a small village of 4,000 surrounded by an ocean of olive trees that hosted its first Vuelta stage in 2010. Locals packed themselves 10-deep on the brutally steep finishing ramp of 25 percent as if it was a summer block party. It was back in 2017 for a fifth time as part of stage 14. Guillén also realized that the Vuelta came at the end of a long and demanding racing calendar when riders were tired. With only three grand tours in the world, he figured if he polished the Vuelta, he might be able to draw the big stars. His vision was as simple as it was engaging: shorter stages, lots of climbs, and a GC battle that would go down to the wire. “We try to make every stage count. We try to make every day a mini-movie,” he explains. “The Vuelta changed the model of what a grand tour can be. We do not have a dogma. What works for the Vuelta might not work for the Giro or Tour. We are happy where we are.” Guillén isn’t complaining. After some financially lean years, the Vuelta is booming again. The world’s top GC riders are flocking to Spain. 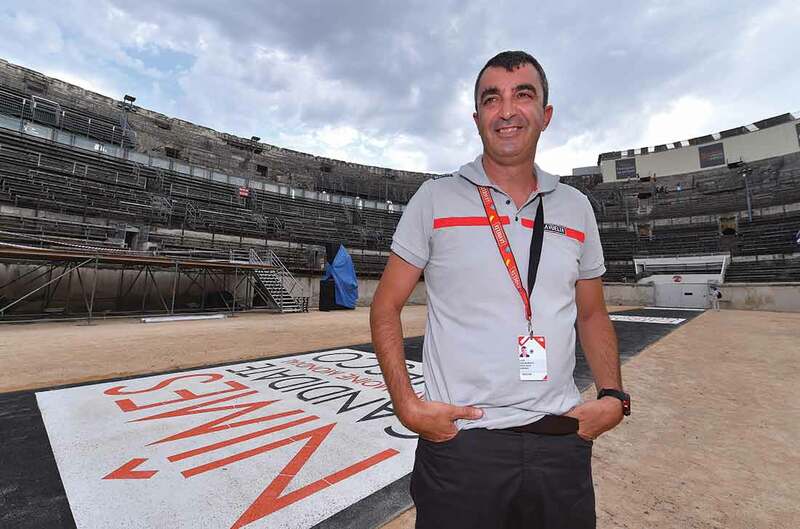 How much have the French had a hand in the reinvention of the Vuelta? According to insiders, the French are leaving the Vuelta to the Spaniards. THE VUELTA DISCOVERED THE magic formula. For Guillén, the perfect Vuelta is a race decided on the penultimate stage on the very last climb. He wants the race to unfold like a soccer match coming down to penalty kicks. The emphasis on tough climbs did have a consequence. From 1995 through 2013, all but one world champion raced the Vuelta to prepare for the end-of-year road race. By 2014, the Vuelta was getting too hard. Michal Kwiatkowski didn’t race the Vuelta in 2014 because of the demanding course. Sagan raced the Vuelta in 2015 but skipped it in 2016. Sprinters don’t even bother coming anymore. Why? There are almost no sprints. Another key moment came in 2011. A relatively unknown rider from Kenya named Chris Froome came within 13 seconds of winning the race that year. Ever since then, Froome put the Vuelta on his radar, racing every year except in 2013. The battles between Froome, Contador, Nairo Quintana, and Esteban Chaves have converted the Vuelta into the most interesting stage race of the season. Froome won this year’s race, so he can check that off his list. Short is the new long. While professional cycling, at its core, will remain about suffering, endurance, and sacrifice, the Vuelta helped usher in a new era of wild, dynamic, shorter, unpredictable stages. Remember the stage to Formigal at the 2016 Vuelta? It was arguably the best stage of the decade. Froome lost the Vuelta that day. Team Sky remembers. They tweaked Froome’s training schedule for 2017 to have something left in the tank after the Tour for a shot at the Vuelta title. Stage races are rarely decided in one singular moment. The Tour is all about control and calculated power. The Giro often comes down to a battle between two or maybe three top riders. But it’s at the Vuelta where the race can turn on its head. It’s at the end of the season. Riders are racing on fumes. Their ambitions often outstrip the gas they have left in the tank. Why do all the top riders keep coming back? There are a few reasons: teams want more, riders want more, and, most importantly, because it comes after the Tour, there’s nothing to lose. But the main reason is that the Vuelta has found the right amount of difficulty. In 2013, Chris Horner became the unlikely winner of the Vuelta. He hit top form early, nursed a slender lead, and fended off Vincenzo Nibali on the penultimate stage up the Angliru. He later told VeloNews he had eaten his favorite meal — a McDonald’s Big Mac and fries — the night before the brutal stage. It’s that kind of anything-goes ethos that continues to gyrate through the Vuelta even though it’s harder than ever. Spain is a relaxed country, where family, meals, and vacation are still more important than how much money you make. The Vuelta reflects that. The racers, sport directors, bus drivers, and journalists agree it is their favorite grand tour of the year. Sure, the Tour is more prestigious, and the Giro is more passionate, but La Vuelta is La Vuelta. Venga! Who is going to win? No one has the slightest idea, and that’s why we love it.